Carrots seeded from Scarlet Nantes but I may have had some other varieties growing in there as well. Carrots have typically been slow to sprout in this climate (dry, hot) so I saved seeds. These seeds sprouted slightly better than the packet and the carrots I harvested were good. I did have one that seeded without forming a significant root. First generation went into the ground this year and if you don't mind having seeds that are a bit older (viability may be decreased) you're welcome to have some. 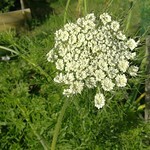 Second generation (from a carrot that waited a reasonable time to flower and developed a good tasty looking root) is currently flowering and will hopefully seed for planting next spring. Quantity of 1000 just represents "a lot." I have a lot.